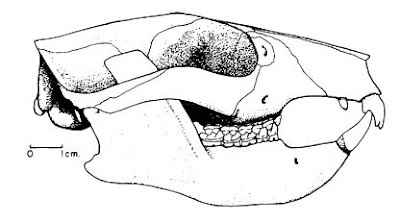 Skull of Plesiadapis tricuspidens, from Gingerich (1976). The name Euprimateformes was coined fairly recently by Bloch et al. (2007) for a clade uniting crown-group Primates and the extinct plesiadapoids (the exact definition was "the clade stemming from the most recent common ancestor of Carpolestes simpsoni and Homo sapiens), excluding even more basal stem Primates such as paromomyids. The plesiadapoids include the taxa Plesiadapidae, Carpolestidae, Saxonella and Chronolestes and were found in North America and Eurasia from the late Early Palaeocene to the end of the Early Eocene (a possible plesiadapoid has also been described from Africa). Reconstruction of Carpolestes from here. 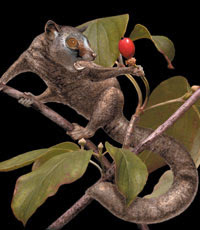 Plesiadapoids would have been not dissimilar to squirrels or modern tree shrews in size and appearance. They possessed large, forward-pointing lower incisors and originally fairly long skulls. Few plesiadapoids are known from extensive postcranial remains but what we do know indicates a fair amount of ecological divergence (Bloch et al., 2007). Carpolestes possessed a nail rather than a claw on its hallux (opposible big toe) and shorter claws overall, indicating that it was a grasping climber (wrapping its digits around branches) like modern primates rather than a clinging climber (hanging onto branches with its claws) like squirrels. Plesiadapis, on the other hand, had long narrow claws and was probably more of a clinging climber. Some authors have suggested a more terrestrial lifestyle for Plesiadapis; such interpretations are not currently popular (Kirk et al., 2008) but it would be interesting if postcrania were available for the largest and one of the latest of the plesiadapids, the European Platychoerops, which was comparable in size to a groundhog (Gingerich, 1976). Also notable among plesiadapids was Chiromyoides which appears to have been a specialised seed-eater with a short and deep jaw (and presumably skull) and massive incisors. 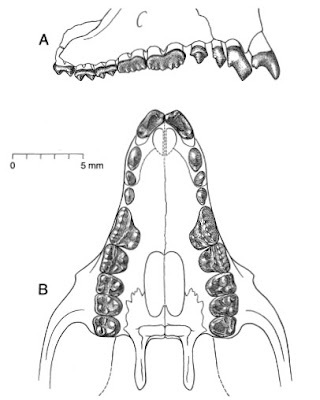 Lower jaw of Carpolestes simpsoni from Bloch & Gingerich (1998). Carpolestids also showed a trend towards reduction in the length of the skull, but the really neat thing is what they did with their teeth, for which Carpolestes simpsoni can be taken as one of the best-known examples (Bloch & Gingerich, 1998). In the lower jaw, the anterior teeth were greatly reduced except the large first incisors which were followed by two teeth reduced to mere nubbins (identified as the second incisor and the canine). Only a single premolar remained (identified as the fourth) but to make up for it that tooth was huge, a massive blade-like multi-cusped structure that ground against the similar obscenely complex third and fourth premolars in the upper jaw (another derived carpolestid, Carpomegodon jepseni, retained a small third premolar in the lower jaw - Bloch et al., 2001). In comparison to all this, the three molars that followed were rather pedestrian. Biknevicius (1986) interpreted this tooth arrangement (comparable only to the multituberculates among other mammals) as indicative of a diet of foods with a tough exterior that would have been pierced by the premolars but a soft interior that did not require a huge amount of molar processing. Carpolestids were probably omnivorous, feeding on insects, seeds and fruit, with later forms becoming increasingly frugivorous. 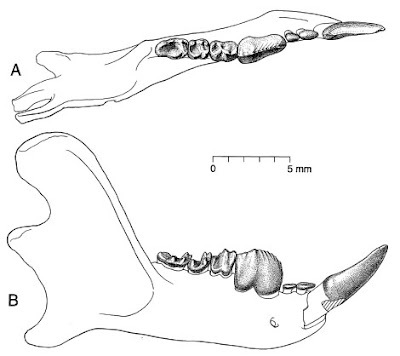 Upper dentition of Carpolestes simpsoni from Bloch & Gingerich (1998). Biknevicius, A. R. 1986. Dental function and diet in the Carpolestidae (Primates, Plesiadapiformes). American Journal of Physical Anthropology 71 (2): 157-171. Bloch, J. I., D. C. Fisher, K. D. Rose & P. D. Gingerich. 2001. Stratocladistic analysis of Paleocene Carpolestidae (Mammalia, Plesiadapiformes) with description of a new Late Tiffanian genus. Journal of Vertebrate Paleontology 21 (1): 119-131. Bloch, J. I., & P. D. Gingerich. 1998. Carpolestes simpsoni, new species (Mammalia, Proprimates) from the Late Paleocene of the Clarks Fork Basin, Wyoming. Contributions from the Museum of Paleontology, The University of Michigan 30 (4): 131-162. Bloch, J. I., M. T. Silcox, D. M. Boyer & E. J. Sargis. 2007. New Paleocene skeletons and the relationship of plesiadapiforms to crown-clade primates. Proceedings of the National Academy of Sciences of the USA 104 (4): 1159-1164. Gingerich, P. D. 1976. Cranial anatomy and evolution of Early Tertiary Plesiadapidae (Mammalia, Primates). The Museum of Paleontology, University of Michigan, Papers on Paleontology 15: 1-141. Kirk, E. C., P. Lemelin, M. W. Hamrick, D. M. Boyer & J. I. Bloch. 2008. Intrinsic hand proportions of euarchontans and other mammals: implications for the locomotor behavior of plesiadapiforms. Journal of Human Evolution 55: 278-299. This has nothing to do with the above post but as soon as I found it (here) I thought it was too fantastic not to share. 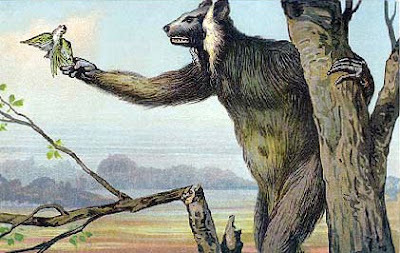 From a German book published in the early 1900s, illustrated by one F. John, comes perhaps the creepiest reconstruction of the giant lemur Megaladapis ever. "Euprimatiformes" would have been better Latin. Platychoerops would mean "flat pig face", which I can't help but find hilarious.
" this tooth arrangement (comparable only to the multituberculates among other mammals)"
Isn't it also known in polydolopids and some other marsupials? 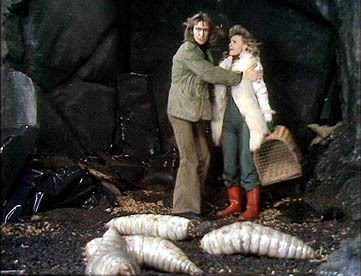 If I understand Biknevicius correctly, polydolopids and the like didn't employ the same chewing method as inferred for multis and carpolestids. The painting of Carpolestes reaching across from its branch to grasp a piece of carp (=fruit) to (mo)lest, with a white background instead of black, is used as cover art for the "Journal of Mammalian Evolution". Similarities of dental and jaw adaptations to Multituberculates are intriguing. Some decades ago there was a fascinating article (no I can't recall the author or the title, alas, and I'm not even sure what journal it was in) about the decline and fall of Multituberculates, working from data on frequency of fossils of Multi and other taxa over the early Cenozoic in the American West. Conclusion was that it was plausible to think that what finally pushed them over the edge was competition with Rodents, but that an earlier phase of the decline was caused by competition with ... Primates! And just to push the connection a little further, Gingerich seems to also attribute the extinction of plesiadapids to competition with rodents. For what it's worth I'm pretty sure that Carpolestes painting is by Doug Boyer. According to Tabuce et al. (2004), there are at least two different African plesiadapoid species. They considered the Eocene Azibius and Dralestes to be distinct enough for placement in an endemic African clade, Azibiidae. And yeah, that Megalapis reconstruction looks totally creepy. What is it doing to that bird anyway? Is it trying to catch it, or is it holding out its finger for it to perch on? Tabuce, R., Mahboubi, M., Tafforeau, P. & Sudre, J. 2004. Discovery of a highly-specialized plesiadapiform primate in the early-middle Eocene of northwestern Africa. Journal of Human Evolution 47, 305-321. I think it's trying to catch it. Interpretation is made a little difficult by the fact that the bird doesn't seem to have a head. 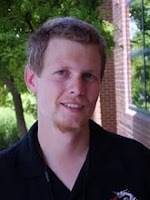 "If I understand Biknevicius correctly, polydolopids and the like didn't employ the same chewing method as inferred for multis and carpolestids." I've now looked the paper up, and you're right. Seems like the upper premolars are different. Suppose we take as a working hypothesis that rodents replacing plesiadapoids replacing multituberculates really WAS an instance of competitive replacement. (Yes I know it's incredibly difficult to demonstrate the truth of a "just so story" like that, but it seems plausible enough that research inspired by it could be worthwhile.) Next question is: how and why? Could someone (would this be accepted as a Ph.D. project at, say, the Columbia/AMNH vertebrate paleo program or the Chicago Committee on Evolutionary Biology?) compare the functional anatomy of, say, Ptilodus, some Plesiadapi-whatever, some Eocene "sciuravid" and some (comparably sized) extant species of Sciurus to see if there are any hints as to what might have made the later ones MORE EFFECTIVE competitors? My guess (we intellectuals are biased in favor of brains!) is that there might be evidence of improvements in the nervous system: larger cerebellum etc. I've looked at a squirrel skull, and it seems to me that they have quite sizable brain cases (larger, proportionally, than those of Australian possums). And I've been watching the local (Edmonton, Canada) squirrels (actually Tamiasciurus, not "straight" Sciurus) and being impressed by their speed and agility. Could the key be that the replacing types were quicker and better at jumping from branch to branch, and so more successful in reaching food and escaping predators? While I'm raving about squirrel/Plesiadapid comparisons... I note the remark that Platychoerops was "groundhog" sized. The groundhog (a.k.a. woodchuck: the eastern North American species of a genus, Marmota, otherwise known as marmots) is, of course, a large ground squirrel. So if Platychoerops WAS more terrestrial than the other P's, we have another analogy between Plesiadapidae and Sciuridae: both are mainly arboreal families but gave rise to larger terrestrial forms. Not, I suppose, that that is a SURPRISING development. It's not something I'm hugely familiar with, but I get the impression that Palaeocene mammals in general seem to be "ficker" than later taxa. Certainly the larger size of Platychoerops makes it tempting to wonder if it was terrestrial, but I'm afraid that if I was to assume that it was without actual postcrania to tell me, a binturong may come and slap me. I suppose the background of the Megaladapis picture are the reports that tamed indris were used to catch birds. I read somewhere that this was actually not the case, but only a tell-tale, but it seems probable that the artist who did draw this Megaladapis had heard about the bird-catching indris. The head of the Megaladapis on the old picture is also much too small, the head of this lemur was really very big in relation to the rest of the body.